There is a major tradition around eating fried food for Hanukkah, since oil is such an essential part to the Hanukkah story – a miracle that allowed one day’s worth of oil to light a menorah for eight days. Though we love the traditional fried donuts sfenj and sufganiyot – there is also another Hanukkah tradition we have just learned about – eating cheese! The origins of eating cheese on Hanukkah begins with the story of Judith, who is said to have given an enemy general salty cheese to make him thirsty, becase of this he became drunk, allowing her to later kill him. So that may be a little morbid… but the importance of cheese to the story has led to delicious cultural traditions of enjoying cheese at Hanukkah time! Though the tradition is not as big in the US – it has a stronger foothold in Europe. Popular ways to enjoy cheese on Hanukkah are tasty Italian ricotta latkes, cream cheese rugelach and cheese blintzes. We came across one of the most unusual cheeses we have ever encountered at the new Whole Foods in Cleveland, which looked like tiny wedges of lemon cheesecake. Turns out it was a baked buffalo milk ricotta, flavored with lemon, from the Puglia region in Italy. When the ricotta is baked it takes on the texture and consistency of a cheesecake! So is it a dessert or a cheese? Maybe a little of both…. When it is whole, the cheese looks like a round or bundt cake (which may vary between brands), and you can buy the whole thing or little wedges. So even though you will usually find this in the cheese section, we think it may be better suited to the dessert case. We also saw this cheese in the inimitable DiBruno Brothers in Philadelphia, so we are hoping it will be relatively common in cheese stores with better selections (or Zabar’s online). We think we have found the perfect dessert for cheese lovers (or cheese for dessert lovers)! We were afraid to eat in Venice. Maybe it is because of a super strict ordinance serving fines and police scrutiny for eating in St. Mark’s square. Not that many tourists would have dared, considering that St. Marks was well under 2 feet of water when we arrived on a soggy cold day. However, with this first impression, we were a little intimidated, since getting food from various shops, cobbling together a picnic meal and eating al fresco is our obligatory European mealtime. But, no matter, we figured out a way to do it, and you can too. Our first stop was the Rialto Market. Rialto Market is a classic open-air fruit and veggie market. It is surprisingly un-touristy though you will find quite a few tourists alongside the hustle and bustle of locals. By 2:30 everything is pretty much closed up – so hurry to get there before lunchtime if you can. We picked up some Sicilian oranges and sundried tomatoes, though as you can see there is a wide variety of produce available (and even some chili peppers and flowers). In order to supplement our fruit and veg we got cheese and prosciutto at Casa Del Parmigiano (San Polo, 214, 30125 Venezia). It is an absolutely tiny little store, but is completely packed with cheese. In fact, this is probably one of the highest cheese-to-square foot ratios I have ever seen. The store has been in operation since 1936 and you can tell they are experts at the craft of cheese. There is every type of Italian cheese under the sun We got some goat’s milk Latteria della Valsassina cheese to go, which was creamy and mild. In addition, there is a small but well-curated selection of prosciutto, and the San Daniele we chose was among some of the finest we ever tasted. We picked up two little ciabatta rolls from a grocery shop nearby to complete our sandwich. We ate clandestinely, evading authorities just off the Rialto market under a covered sidewalk that led to some sort of governmental building. Our final stop Gelatoteca SuSo (Calle della Bissa, 5453, 30124 San Marco, Venezia). It is a little way back from the canal and found it only through a 6th sense that directs us toward gelato products. Suso makes gelato artiginale – artisinal gelato – produced in-house in a large number of unusual flavors. M got the Orient Express (cinnamon, clove and caramel) and L got Death in Venice [ha ha!] – coffee and chocolate swirl. The gelato was excellent, and the perfect finish to our al fresco lunch. Though we had to do it on the sly – we managed to find (and eat) some non-touristy food in Venice. Wherein the Fearless and Intrepid Lindsay and Matt Consume Much Free Meats and Cheeses Before Purchasing Even More. The Pastoral Artisan Producer Fest, an annual April tradition held in the Chicago French Market, serves up a crowd-pleasing recipe for disaster: free samples of meat, cheese, and alcohol to any hungry Chicagoan who wanders in the door. With nearly one-hundred locally-sourced, artisanal, and talented vendors, the Fest may be one of the city’s best opportunities to eat well at zero cost. When we arrived at 11am, no wonder the place was already packed to the gills. One can easily get overwhelmed in the crowds, and the many patrons cutting in line to get samples. Here’s the thing, though: there is enough for everybody. Really. As such we tried, as best we could, to take our time: wait in lines, sample everything we could, talk closely with the vendors and makers about their products, snap photos when we had the chance, and save our favorite selections for purchase at the Pastoral counter at the back of the market. So, we meandered amongst the fifty tables, each showcasing two of the nearly one hundred producers of fine meats, cheeses, wines, spirits, and other accompaniments from around the country. With this slow-going method, we sampled the offerings at about half the tables (snaking through the lines at all of them would have taken all day) and took special attention to spend time at the section devoted entirely to Wisconsin cheese makers. Prosciutto, salame, mortadella, etc. from Smoking Goose Meatery. Matt quickly made a bee-line for the charcuterie purveyors. Deservedly, much praise has been heaped upon West Loop Salumi right here in Chicago, and we did love their selections. At the end of the day, though, we could not escape the draw of the Stagberry Salame (pictured at center in the above photo) made by Smoking Goose Meatery in Indianapolis. Stagberry features ground elk – a meat neither of us had tried before – studded with blueberries and soaked in honey wine. A brilliant balance of bold flavors, this hiking-trip in a sausage was worth every penny of its $36.99/lb price. At the end of the day we purchased half a stick for a very reasonable eight dollars. Little Napoleon (left) and Manchester (right) from Zingerman’s Creamery. Cheese was everywhere at the fest, with over one third of the vendors dedicated specifically to cheese. Wisconsin, as we mentioned before, boasted its own section – including the amazing offering of a free map of Wisconsin cheesemakers, which now sits in our glove compartment in case of emergencies. We made a point, however, to venture outside the Dairy State this day: Zingerman’s Creamery in Ann Arbor, Michigan (above) served up samples of its aged, soft Manchester and Little Napoleon cheeses. We were also big fans of their burrata, a creamy mozzarella mixture, and went back for seconds. Our were won, however, by the Bijou produced by Vermont Creamery: a simple, French-inspirted, aged goat’s milk cheese that was perfect for spreading and reminded us of similar table offerings we often encountered in Portugal. At $10.99 for two, we took one and ate it for lunch (in addition to all the other samples we had). Helpful assistance with choosing at Pear Tree Preserves. Finally, while meat and cheese ruled the day, we can’t overlook the other offerings. Patrons had a seemingly endless choice of wine and spirits, dessert items, as well as other accompaniments. A great match for many of the cheese would have been one of the local, organic fruit spreads orpreserves from Pear Tree Preserves, based right here in Chicago. We had a cherry preserve that was delectable, great for pairing, eating alone, or thickening into a pie filling. You can check out their current flavors list. While we were forced to make purchases – and we hope others did as well, as it seems sinful to wade through all these free samples of skilled labor and not buy anything – honestly, we didn’t dislike a single thing we tried. As such, don’t consider our list exhaustive or best-of-the-best by any means. Take a look at the Fest’s vendor list, and support these local makers even if you did not have a chance to attend! 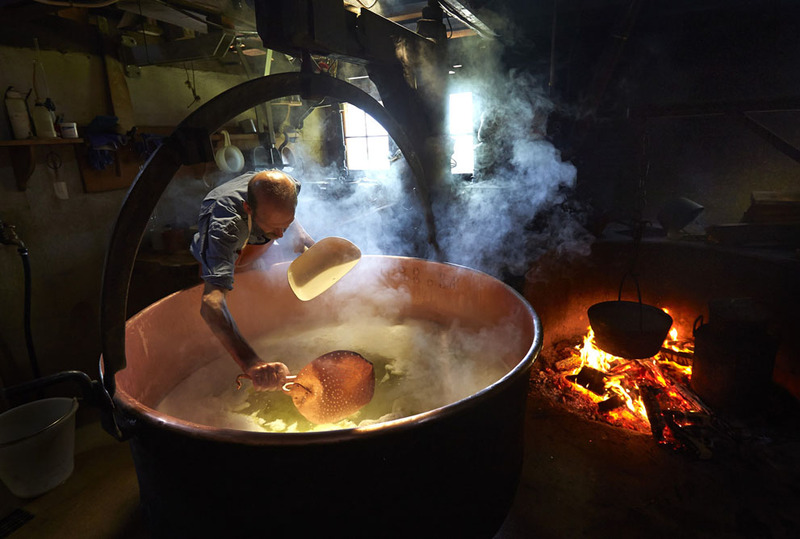 The Atlantic has an amazing photo series on Swiss cheese makers, the Murith family, during their seasonal production of Gruyere cheese. The pictures take the term “pastoral” to a whole new level. Purple Pig in Chicago (500 N. Michigan Ave, Chicago, IL) is one of our favorite places to get cheese or charcuterie, that is, if you are able to get a table at this tiny no-reservations spot (don’t count on it). 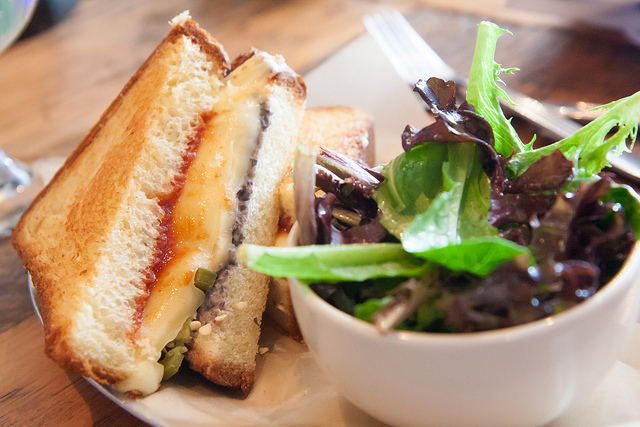 Purple Pig has an extensive selection of well-curated cheeses from all over the world. Some on the list we had previously tried (Fontina, Lincoln Log and Robiola), while others were new to us (Quadrello, Iborez, St. Agur). You can make your own cheese plate for $7 per cheese, 3 for $19, or 5 for $32. One now-favorites we first encountered on the Purple Pig cheese list was Blu di Bufala. The name will likely give you a clue to its contents: a blue cheese made with buffalo milk. Now we are practically obsessed with Mozzarella di Bufala, so we figured we would love this variety, and we were right. There was a strong blue flavor, but the cheese itself was extremely creamy – almost buttery – and it wasn’t overpowering at all. Blu di Bufala hails from Bergamo, Lombardy in northern Italy, and is made by Caseificio Quattro Portoni. This cheese was first made by the Gritti brothers who run Caseificio Quattro Portoni, in 2005, and it has already taken second place in the World Cheese Awards (yes, this is a real thing). Today the brothers manage a herd of 1,000 Water Buffalo to make the cheese. You can buy Blu di Bufala in cheese stores throughout the US, and online. If you can get your hands on some, Blu di Bufala is great for snacking, and for the ambitious, DiBruno Bros. has a creative recipe for a dessert grilled cheese with Blu di Bufala on chocolate cherry bread. We absolutely love the Dane County Farmer’s Market in Madison. It is gigantic, and you can get pretty much any type of produce or baked good there. However, we are creatures of habit, and we make a fairly predictable round of purchases (Hook’s Cheddar, Heirloom Tomatoes, Cilantro, possibly honey, and a few others). One of things we have to get every time we visit is Stella’s hot and spicy cheese bread (which is as awesome as it sounds), and we know many others who feel the same. However, we never really knew the backstory behind the bread. WXOW has the inside scoop, and you may be surprised to learn its origins are actually related to tamale production. You can find the bread in other locations around town, but getting it at the farmer’s market is the best since it is delivered fresh and hot several times throughout the day. If you are far from Madison and craving some cheese bread, Stella’s ships. Or for the more ambitious, Badgerlicious has a DiY recipe. Back in the US we are very familiar with Chihuahua cheese (Queso Chihuahua) and have seen many recipes calling for the mild, slightly yellow cheese. However, we did not know much about its origins – and it turns out it has a rather unusual history. Chihuahua cheese, known for the Northern Mexican state where it is produced, is also known as Menonita cheese in Mexico. Yes, Menonita is “Mennonite” in Spanish – and it is indeed Mennonite cheese! Turns out there is a rather large Mennonite population in Mexico, having first arrived in the 1920s, and they were the ones who first produced the cheese. Though it has now been commercialized, you can still find Menonita cheese being made by Mennonites in the town of Cuauhtemoc, Chihuahua. Recently, there has been a post from the blog Dude Foods making the rounds of the blogosphere about a 100% cheese grilled cheese sandwich: the “bread” in this case is actually Finnish Bread cheese, and the filling is American cheese. So what exactly is “Finnish Bread Cheese?” It’s Finnish name is juustoleipä, or leipäjuusto (leipä=bread, juusto=cheese), and it is similar to the better-known (in the US) Halloumi, and Brazilian queijo coelho. The variety of leipäjuusto Dude Foods used was from Carr Valley cheese in Wisconsin. In order to get the most of this cheese – it should be heated or broiled, giving it distinctive brown grill marks. Though there will probably be a run on this type of cheese for people hoping to recreate the epic “cheese grilled cheese”, there are many other recipes involving leipäjuusto. It pairs particularly well with fruit and jams and you can even dip it into coffee! Don’t quote us yet- but we believe we may have just stumbled upon the best use for leftover cheese ever. Fromage Fort (‘strong cheese’ in French) is an easy-as-pie recipe that turns leftover bits of cheese into a delicious spread – all you need is a little white wine and a few herbs. So it’s not really a recipe, just a good idea with infinite variations. Jacques Pepin has a nice simple take on the spread, as does Alton Brown. Why have we never heard of this recipe before? This Norwegian import, (pronounced “yet-oast”) is hands-down one of the most unusual and distinctive cheeses the eaters have ever sampled. 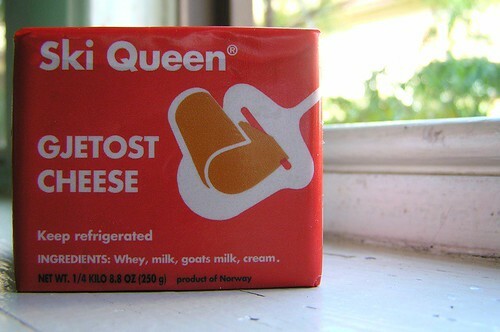 Gjetost is actually known as Brunost (literally ‘brown cheese’) in Norway. If that weren’t confusing enough, Gjetost goes by a variety of names across Scandinavia (Sweden – mesost, and Denmark – myseost). Gjetost is made from goat and cows’ milk and whey, which is boiled to a caramel brown and a soft consistency. Due to this caramelization, the cheese has a sweet, burnt sugar taste. Gjetost is commonly served sliced very thinly on top of fruit or crackers. This unusual cheese is commonly available at Whole Foods and many specialty stores. The most common variety in the US is is Ski Queen, which is found in a distinctive red package, as seen below. As you can tell by reading this blog, both L and M are big fans of cheese. When we’re traveling we never miss an opportunity to scout out the local cheese shops. On a recent trip to Philly had the chance to visit one of our favorite cheese shops – DiBruno Brothers. When L used to go to school in Philly, she visited this DiBruno Brothers location at least every couple of weeks (she also turned M into a convert). Though M is not from Philly, he lives in Wisconsin, so needless to say, he takes his cheese very seriously. It’s our cheese-loving opinion that DiBruno Brothers is one of the best cheese stores around. The first thing DiBruno Brothers has going for it is its location smack dab in the middle of Philadelphia’s Italian Market. The Italian enclave in South Philly is big, bustling and vibrant, unlike many others (our trip to the NYC Little Italy was underwhelming and frankly kitschy), and the famous Italian Market is located in the middle of this Little Italy. Philadelphia’s Italian Market, though perhaps less impressive than it was a few decades ago, still provides a wide range of small, authentic, family-run Italian shops that would be right at home on a street in Parma or Naples. Though the market is full of great specialty food store, DiBruno Brothers has always been out favorite for its great selection and friendly staff. When you enter, the first thing you notice are the huge cheeses hanging from the ceiling, cured Italian meats sitting on sample plates to eat, a huge cheese counter on one side of the narrow store and a wide variety of dry goods on the other. It goes without saying that cheese is the star of the show. From Italian favorites like Parmigiano-Reggiano and Mozzarella di Bufala to Scandinavian and Argentine cheeses, DiBruno brothers has it all. If there is any variety you would like to try, DiBruno Brothers is generous with samples. The staff are all knowledgeable and helpful and have made great suggestions over the years. The selection is wide and varied, though some of the more unique varieties can be a bit pricey. On our last visit, however, M was on a mission for Garrotxa, a Spanish goat milk cheese he fell in love with back in Wisconsin. Since then he had not seen it anywhere, but DiBruno came to the rescue. Along with a copious variety of cheese from around the world, DiBruno Brothers also boasts a selection of olives, meats and ready made foods. There is enough here to keep you occupied (and fed) for days. The DiBruno empire also stretches into a ready-made food store further up the block in the Italian market, and to a large store and cafe in Rittenhouse Square. However, for us, the DiBruno Brothers cheese store in the Italian market will always be the real deal. This is what heaven looks like!